One hundred and sixty barrows and gilts (21 d old; BW = 6.29 kg) were allotted to 4 dietary treatments and there were 32 pens with 5 pigs per pen in a randomized complete block design. Four diets were fed to the 160 pigs; thus, there was a total of 8 replicate pens for each treatment. Experimental diets were based on a 6-phase feeding program. In Phase 1, four dietary treatments included the positive control (PC) diet containing 23% CP with an antibiotic growth promoter (Mecadox®10; Phibro, Teaneck, NJ), the negative control (NC) diet containing 23% CP without an antibiotic growth promoter, and 2 low-protein diets containing 19% CP (NC+LP1) or 17% CP (NC+LP2), respectively, without antibiotic growth promoter. The diets containing 23 and 19% CP met requirements for all indispensable AA, but in the diet containing 17% CP, indispensable AA were supplied to meet only 80% of the requirement. In Phase 2, there were also 4 dietary treatments: the PC diet containing 22% CP and the antibiotic growth promoter, the NC diet containing 22% CP without the antibiotic growth promoter, and 2 low-protein diets containing 20% CP (NC+LP1) and 19% CP (NC+LP2), respectively, without antibiotic growth promoter. All Phase 2 diets were formulated to meet the requirement for indispensable AA. For Phases 3, 4, 5, and 6, a common conventional diet was used in each phase and fed to all pigs regardless of treatments in Phases 1 and 2. 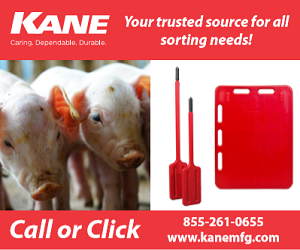 Pigs were fed Phase 1, 2, and 3 diets for 14 d, Phase 4 and 5 diets for 35 d, and Phase 6 diet for 28 d, respectively. Feed was provided on an ad libitum basis and water was available at all times. During Phases 1 to 2 the final BW and overall ADG, ADFI, and G:F were not different among pigs fed the 4 diets, but pigs fed the diet with 17% CP had reduced (P < 0.05) G:F ratio compared with pigs fed the PC or NC diets during Phase 1 (Table 1). During growing to finishing phases (Phase 3 to 6), the final BW and overall ADG, ADFI, and G:F ratio were also not different among treatments. Thus it appeared that even though pigs fed the 17% CP diet had reduced growth performance in Phase 1 compared to pigs fed diets containing sufficient AA, these pigs were able to catch up before market and there was, therefore, no changes in final BW at market. Hot carcass weight, fat thickness, loin eye area, dressing, and lean percentage also did not differ among pigs fed the 4 diets during Phases 1 and 2 (data not shown). This observation confirm that under-supplying AA during the early post-weaning period will not result in long term negative effects on protein synthesis and muscle deposition. During Phase 1, diarrhea score was greater (P < 0.05) in pigs fed the NC diet compared with NC+LP2, but there was no difference among pigs fed PC, NC+LP1, or NC+LP2 diets (Table 2). During Phase 2, the diarrhea score was less (P < 0.05) in pigs fed PC diet compared with NC or NC+LP1 diets. However, the diarrhea score did not differ between pigs fed PC and NC+NP2 diets. A similar tendency was found for the frequency of diarrhea being less for the low protein diets (data not shown). These observations demonstrate that the reduction in diarrhea score that is usually observed when an antibiotic growth promoter is used can be achieved by reducing dietary crude protein concentration. Even if this means that pigs need to be under supplied with amino acids during the initial 2 weeks post weaning that will not affect overall growth performance from wean to finish. Feeding pigs diets containing less indispensable AA during the initial 2 weeks post-weaning will reduce growth performance of pigs during that period. Feeding low-CP diets to weanling pigs for 4 weeks decreases post-weaning diarrhea to the same degree as feeding diets with antibiotic growth promoters. 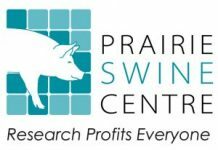 Feeding low-CP diets during the initial 4 weeks post-weaning does not affect overall wean to finish growth performance or carcass quality of pigs, when they go to market. 1Pigs were fed the 4 experimental diets only for Phases 1 and 2 then fed common diets for later phases. PC = diet containing normal CP and an antibiotic growth promoter (Mecadox®10; Phibro, Teaneck, NJ); NC = diet containing normal CP without antibiotic growth promoter; NC+LP1 = a low-protein diet containing low CP without antibiotic growth promoter but with all AA at the requirement; NC+LP2 = a low-protein diet containing no antibiotic growth promoter and indispensable AA were 20% below the requirement in Phase 1. 1Diarrhea score = 1, normal feces, 2, moist feces, 3, mild diarrhea, 4, severe diarrhea, 5, watery diarrhea. 2Pigs were fed the 4 experimental diets only for Phases 1 and 2 then fed common diets for later phases. PC = diet containing normal CP and an antibiotic growth promoter (Mecadox®10; Phibro, Teaneck, NJ); NC = diet containing normal CP without antibiotic growth promoter; NC+LP1 = a low-protein diet containing low CP without antibiotic growth promoter but with all AA at the requirement; NC+LP2 = a low-protein diet containing no antibiotic growth promoter and indispensable AA were 20% below the requirement in Phase 1.